You will be receiving your complimentary download via email AFTER YOU VERIFY YOUR EMAIL! 2. Click on the link listed in the email to verify your request. If you don’t do this, you will not be able to receive the complimentary download you requested! – This is for your protection and privacy. 3. Mark this email as “Not Spam” in your account; this is critical, because we will be sending you valuable information. Make sure you get the best veroniqueinc.com can offer! 4. One extra favor; create a new mailbox in your email program and call it !Freedom! so you can put all your messages in there for safe keeping. Once you do this, you will then receive an email containing your complimentary download. You will now be able to receive announcements from veroniqueinc.com. We want to be sure you don’t miss anything so be sure to mark this in your email box right now. We look forward to sharing information with you. Please let me know if there’s anything we can help you with. See you down the road! 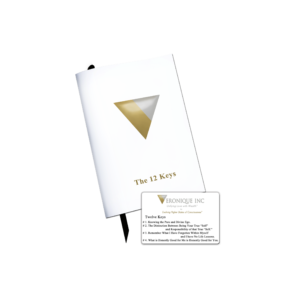 In the meantime, Click Here to find out more about the complete 12 Keys set.